It’s a Les Mis name in the key of Colette, but is this one best left to fiction? 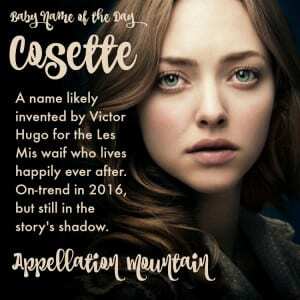 Thanks to Elisabeth for suggesting our Baby Name of the Day: Cosette. Victor Hugo’s Les Misérables is the kind of epic that you probably know even if you’ve never read the 1862 novel, seen the award-winning musical, or watched the blockbuster movie adaptation. Jean Valjean is a convict when we meet him, imprisoned for stealing bread to feed his hungry family. He’s released, but as an ex-con, his prospects are bleak. He assumes another identity, and builds a successful, virtuous life. Or so he thinks. Unbeknownst to Valjean, one of his factory’s employees was dismissed for having a child out of wedlock. The worker, Fantine, has struggled to provide for her daughter, but it proves impossible. Valjean vows to protect the child when he cannot save the mother. 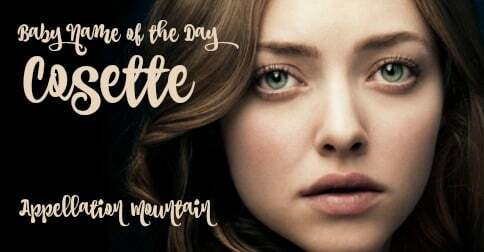 When we meet Cosette, she’s in the care of the Thénardiers, an unscrupulous pair of innkeepers, who charged Fantine exorbitantly for the child’s care while giving her the Cinderella treatment. Like Cinderella, Cosette is beautiful and kind despite her cruel mistreatment. After she’s rescued by Valjean, they begin a new life as father and daughter, and live happily ever after – for a time. Nancy points out that Cosette’s origins are uncertain, but it may be based on chose, the French word for thing, as in the phrase quelque chose – something. Her given name was Euphrasie, and Cosette a nickname. But the nickname is the only one she’s known by in the musical and movie. It’s seen some use in France. Meilleurs Prénoms lists it as a form of Nicholas. The similar Colette is from Nicholas, so it seems plausible. Others have mentioned that Nicholas comes from the Greek for “victory of the people” – a fitting meaning given the themes of Les Misérables. We also know that Hugo didn’t name characters lightly. He describes the origins of Eponine and sister Azelma’s names in the novel, attributing them to Madame Thénardier’s love of cheap romance novels. 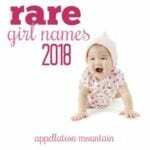 A handful of girls have been given the name in the US over the years. It debuted in 1912, with five girls named Cosette. This tracks with an early movie version, dated to either 1911 or 1913. In 1954, there were 20 newborns with the name – not long after a 1952 movie version and subsequent radio production. The numbers fall briefly, but then comes the 1980 debut of the musical in Paris. Les Mis came to London’s West End in 1985, and Broadway in 1987. It was a Tony Award-winning sensation, and by 1991, 28 girls were named Cosette. It wasn’t fleeting, either – by 2001, there were 77 newborns with the name. The 2012 blockbuster starred Amanda Seyfried in the role. By 2013, there were 113 newborn Cosettes. Alternate spelling Cozette has nearly as long a history of use, and was given to 29 girls in 2014. But is this name is too tied to the movie? has enough of an on-trend style to be viewed independently. In 2014, as the Christmas 2012 movie’s release faded, there were just 108 newborn Cosettes. And yet, I think it could succeed. 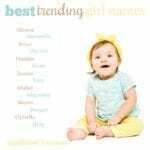 We love French names for girls, and -ette ending names are having a moment. The saintly Colette is catching on once more, which might open the door for the success of Cosette, too. What do you think of Cosette? Is it too tied to the fictional character? Victor Hugo said he created Cosette from “chosette”, meaning “little thing”, in French. So I find it almost like Dolly – a nickname that’s really sweet. I like Dolly, for reference, that’s not a burn. But I find it a bit too little-girly as a full first name. I really like Euphrasie, actually. I’d use that. Thank you so much for this beautiful feature! As you know, I love it!! It’s absolutely on our short list (we’d likely call her Cosy or CoCo). I love that it’s so unique, but so familiar at the same time. Sigh. I met an adorable girl named Cosette recently. Her mom sometimes calls her Coco. I really like it. I’ve seen the name Adelie recently but cannot figure out how it’s pronounced! Is it “Natalie” without the “N”? Or “Adele-ee”?? I am currently reading Les Mis, and I thought the name was so pretty! So I was excited to see this post. Interesting that it seems to be invented by the author– that I never would have guessed. But, anyway, I love the name, althouh I do think it is more tied to the book than anything else. I have yet to meet someone non-literary named Cosette.